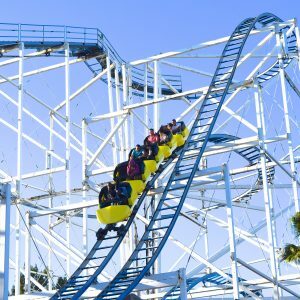 In the wake of our launch of Cabin Crew Coaster Kings, we want everyone to know that we are still 100% here for the parks of California — whether it be major national parks, regional parks, or even the larger Family Entertainment Centers of SoCal. Today we’re visiting two of the smallest parks in the region: Castle Amusement Park in Riverside, and Scandia Ontario. 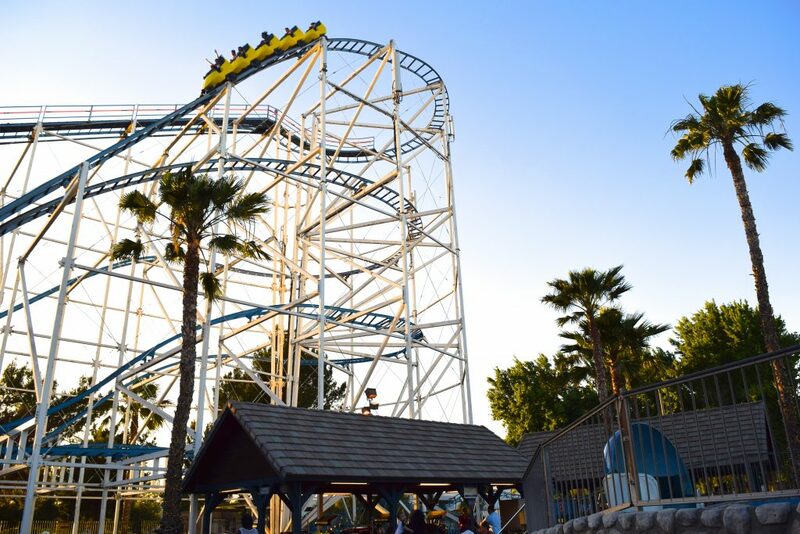 It was my first time visiting Castle Park and Sean’s first visit in about 4 years; it plays host to the only 2 operating roller coasters in SoCal that I have yet to ride. Let’s roll! 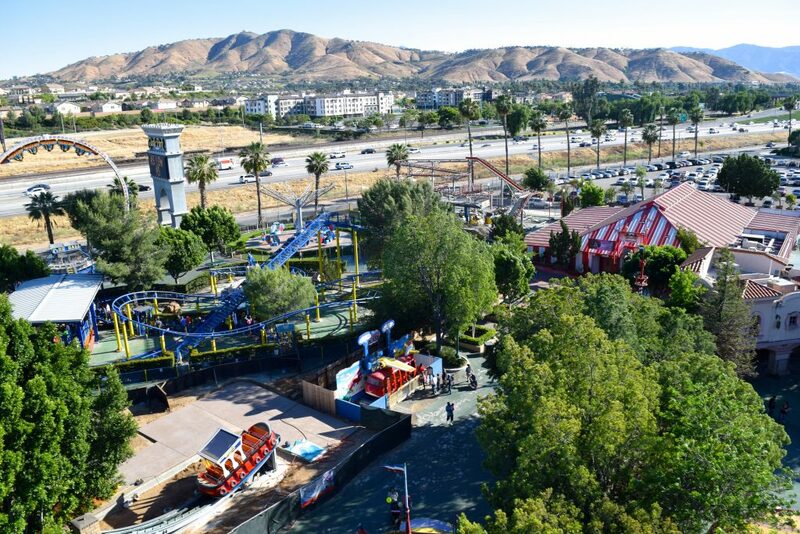 Miniature golf was “closed due to wind”, their only large coaster clearly hasn’t operated in years, and they charge $10 for parking. Not a great first impression. 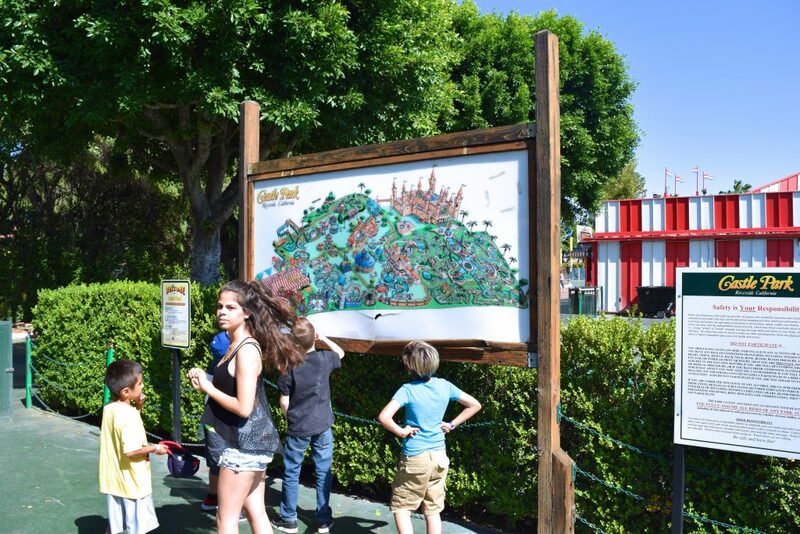 The large, outdated park map housed in shattered Plexiglas accentuates attractions like Screamin’ Demon and a Falling Star ride, both of which are now anything but functioning at this wannabe regional park. There’s no clear answer on the situation with Screamin’ Demon. 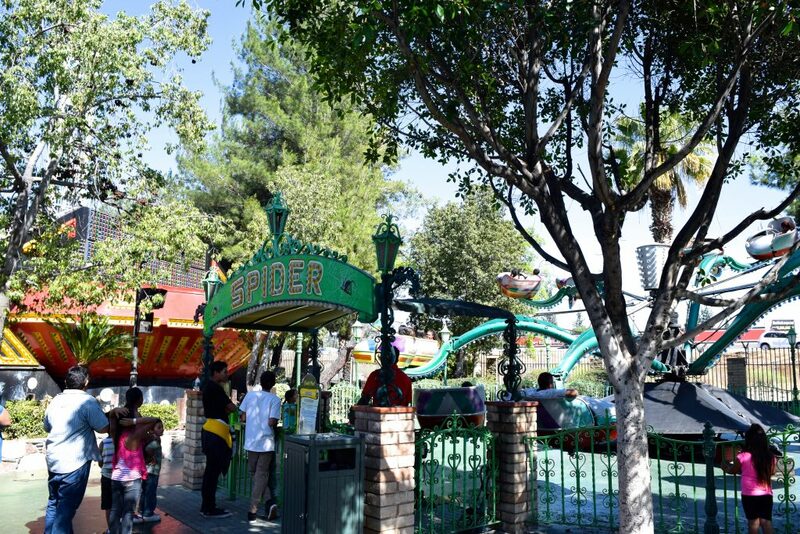 Once the park’s signature ride, the cheap Italian spinning coaster now serves only as a lawn ornament to attract passers-by on the freeway. Merlin’s Revenge, the larger of the park’s two kiddie coasters, was open for us today. 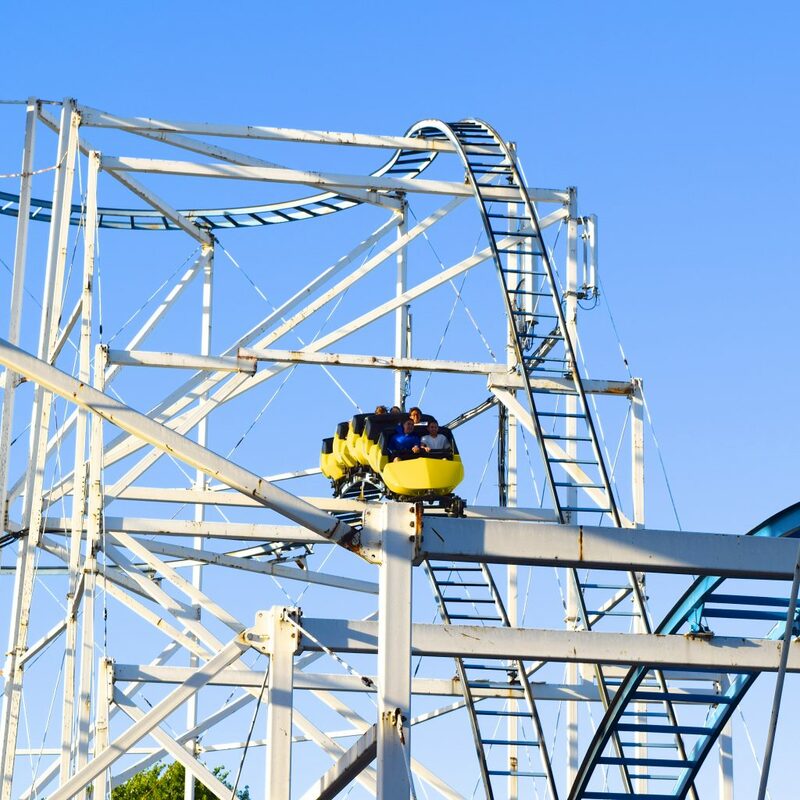 The same could not be said for their Fireball ride, which was dormant mid-loop on our visit. 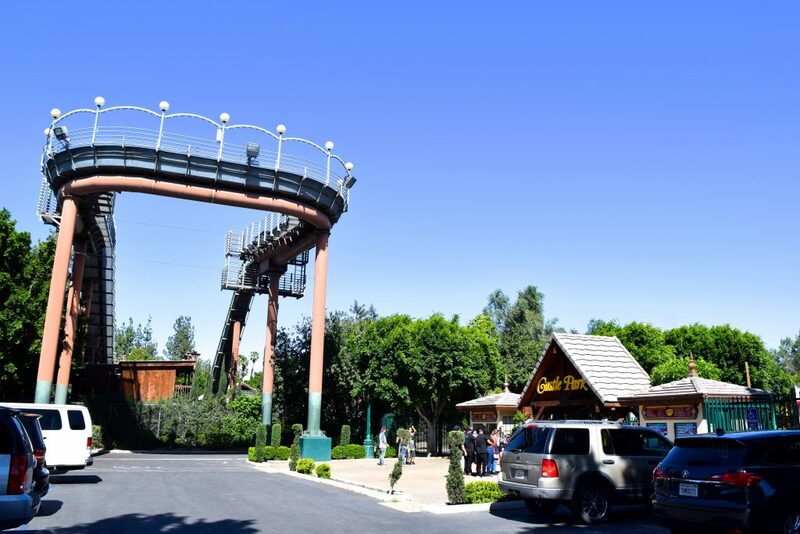 The landscaping around Merlin’s Revenge makes it clear that somebody, at some point, gave a crap about this park. 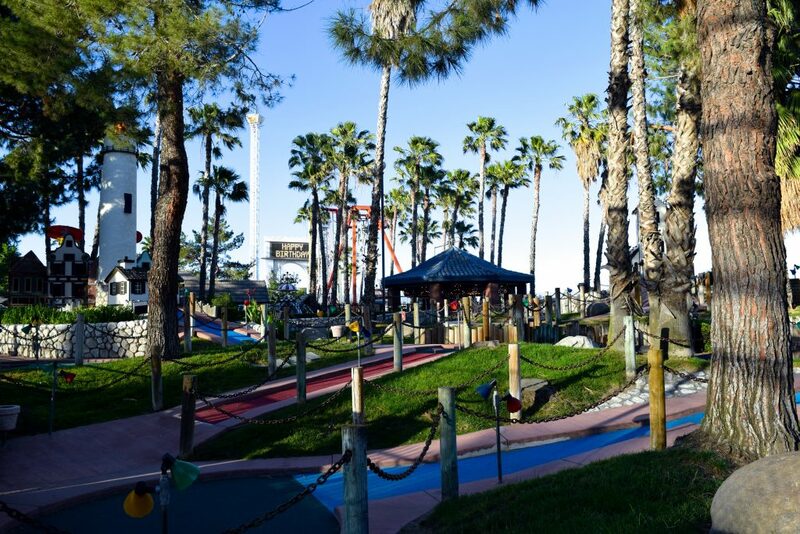 Seasonal refillable drink mugs, $10 parking, online ticket deals, a strict pay-one-price system, and other indicators point to Castle Park really wanting to make it as a regional park, but right now it fails to impress as anything other than an over grown miniature golf course with rides. Castle Park’s best asset is the foliage. 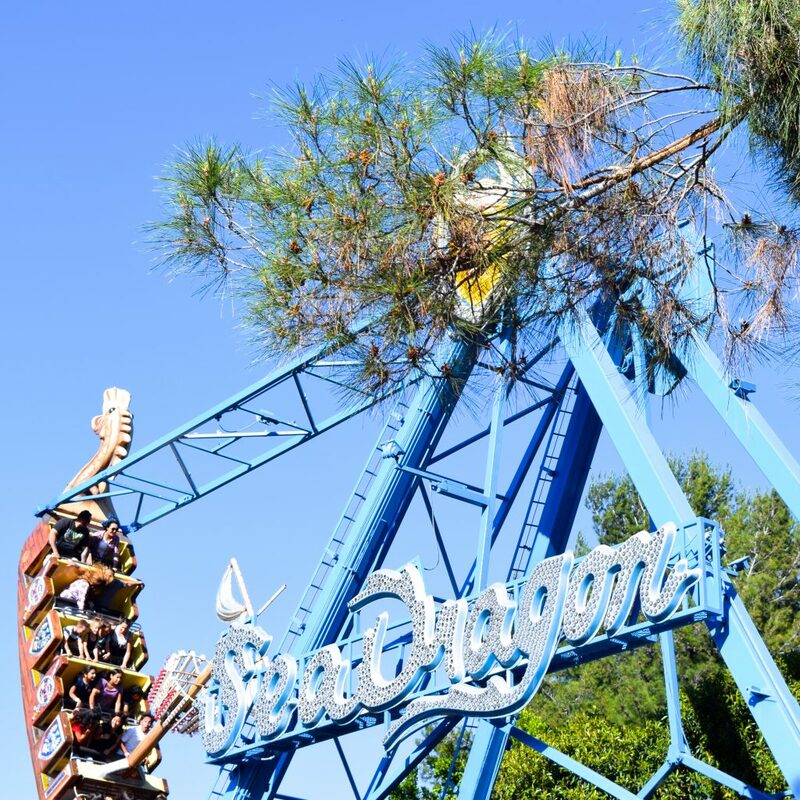 Many of the rides are shaded by a variety of mature trees. Some areas, however, like the area formerly home to the Falling Star ride (now home to a beat-up looking Rock n’ Tug and lots of gravel) offers a less inviting experience. 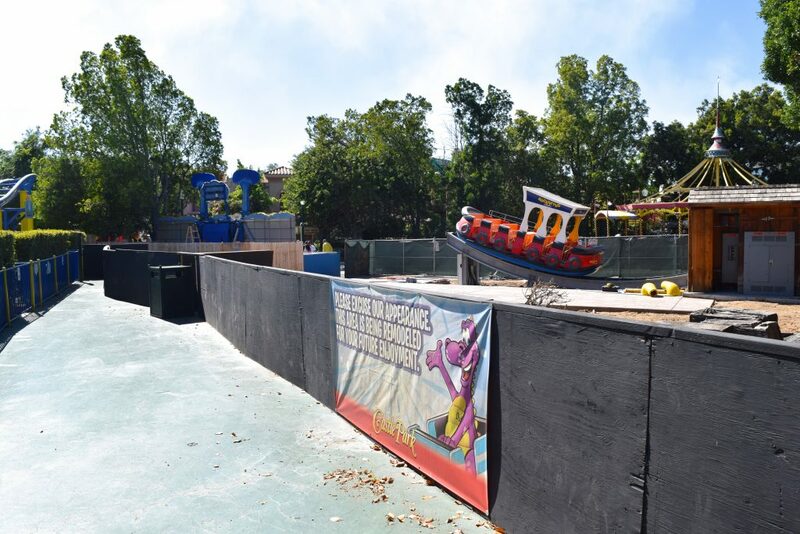 Guests must scale the length of the construction wall to access Merlin’s Revenge. 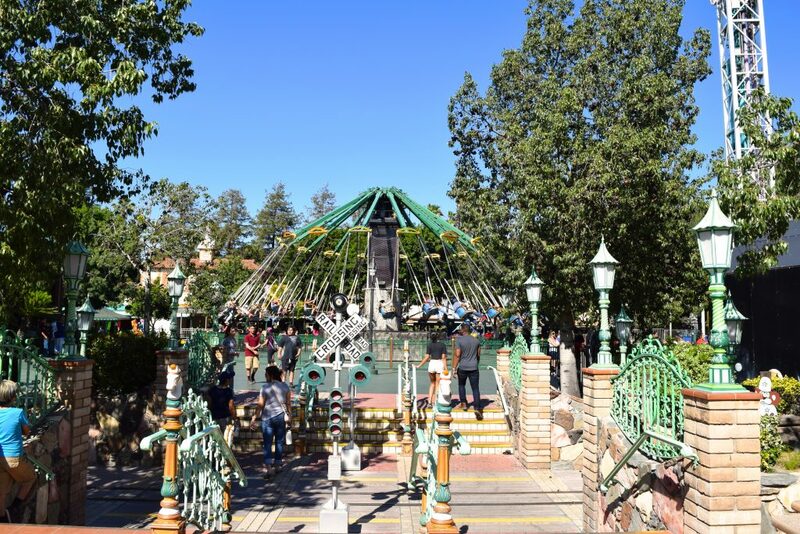 There’s currently no direct passage between the midways that once festooned Falling Star; going around Merlin’s Revenge or the Carousel yields the Castle Park Air kiddie ride and its startling lack of curb appeal. What is this, a mall carnival?? I paid $10 to park somewhere that looks like this!? I respect the purchase of used rides, but don’t expect positive buzz if your upcoming installation looks like it’s been to heck ‘n back. On a separate note, let’s take a moment to appreciate(?) 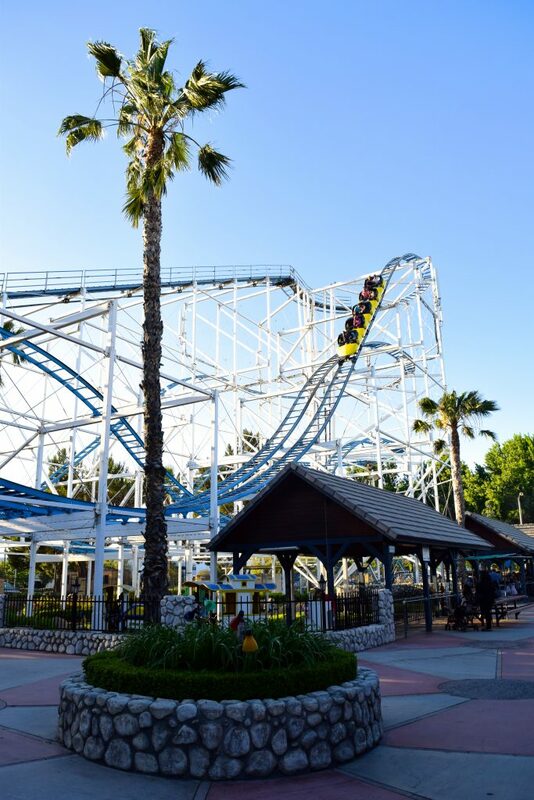 how Castle Park tests their S&S Double Shot with the restraints open. I’m guessing the purpose of this Fireball situation is to do maintenance on various parts of the ring? Some parts of the park really are quite nice. It certainly feels like a regional park in some places. 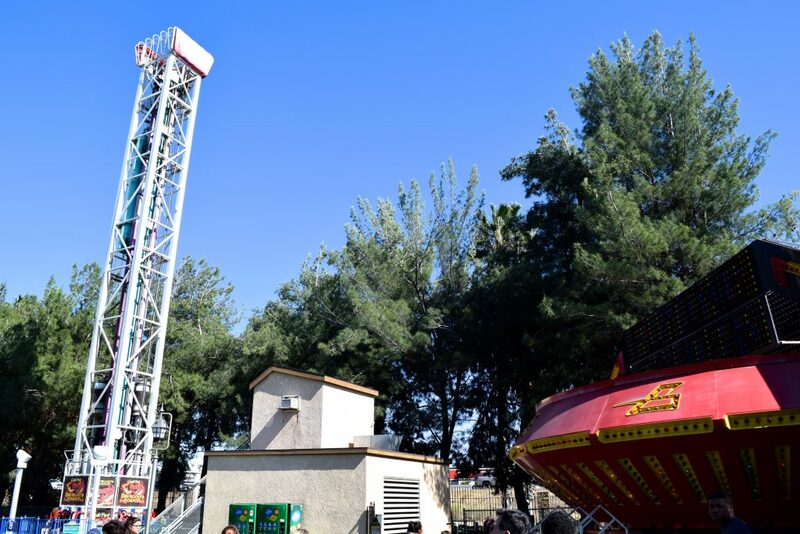 Thank goodness there’s a garden variety carnie Gravitron here to pull us back into reality. Plus a bare-bones Double Shot that’s missing part of its marquee topper. 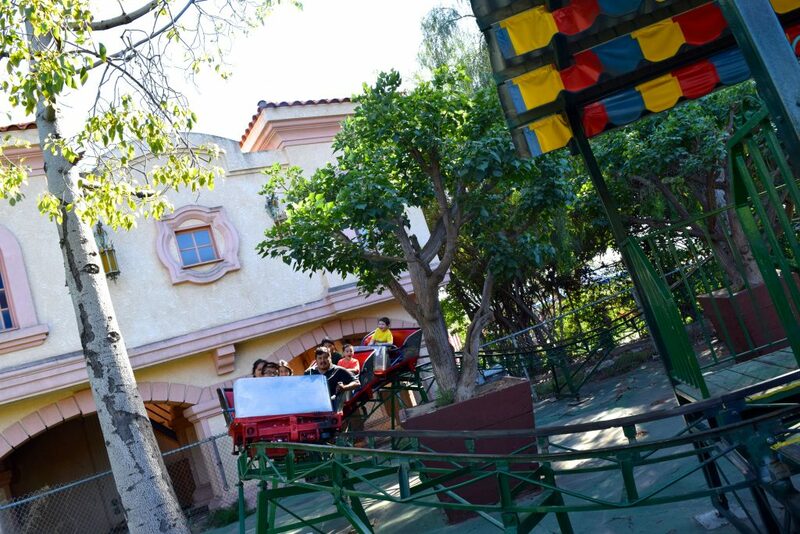 The area with most of the park’s flat rides reads as an imitation of Knott’s Fiesta Village. 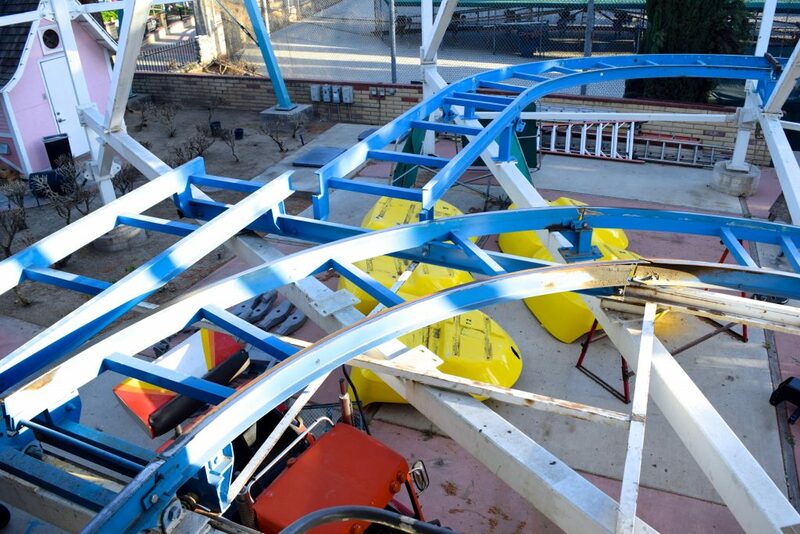 For some reason there’s a huge gap of nothing between the Double Shot and the Scrambler. 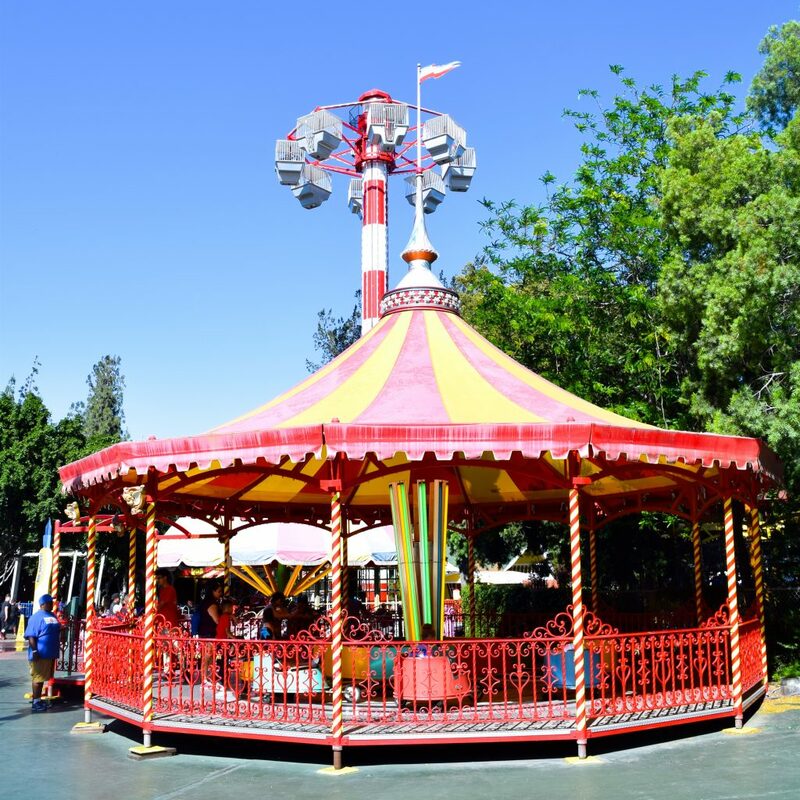 Their carousel looks beautiful. Definitely has the strongest regional park feel of anything at Castle. 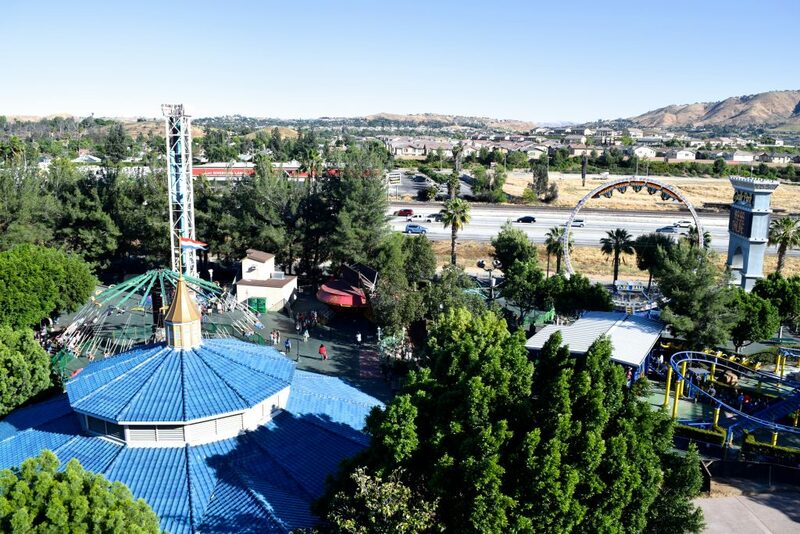 There’s a variety of amusement park mainstays here, but in varying degrees of functionality. 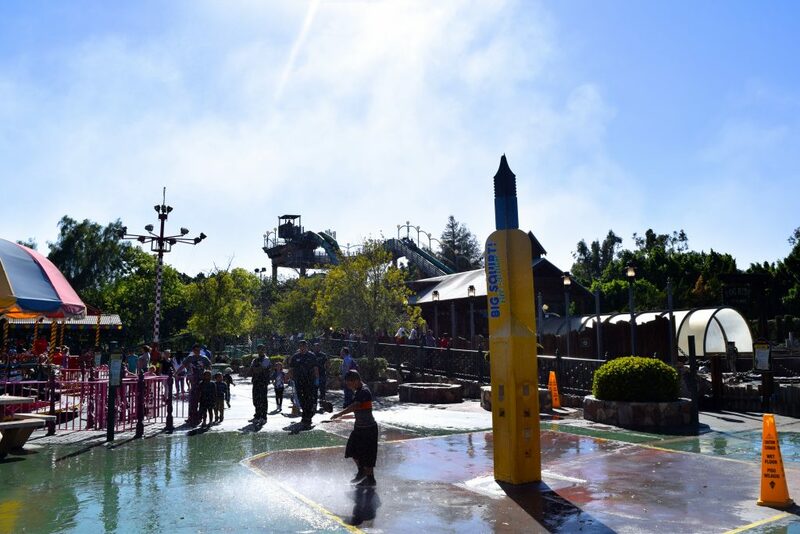 …but then there’s the log flume area with this weird squirt tower thing. It’s both a water play-thing and a refill station for these strange water worm toys they sell at a kiosk nearby. 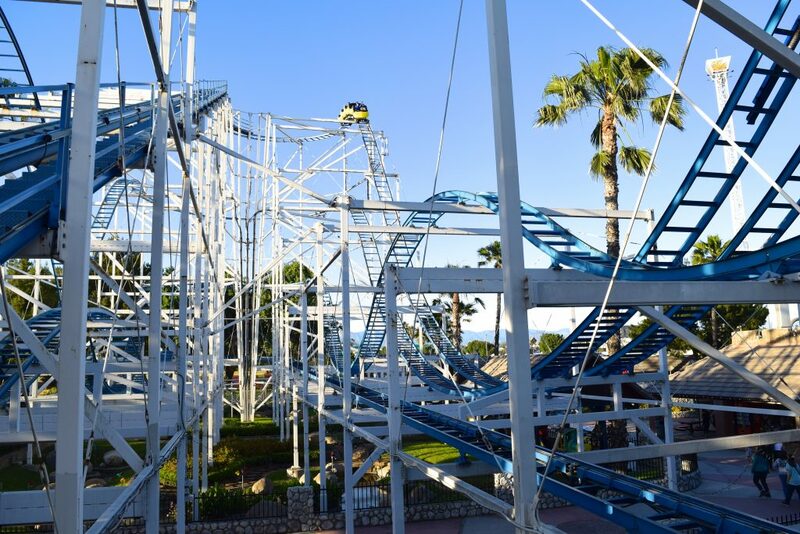 The smaller kiddie coaster is a charming old thing. 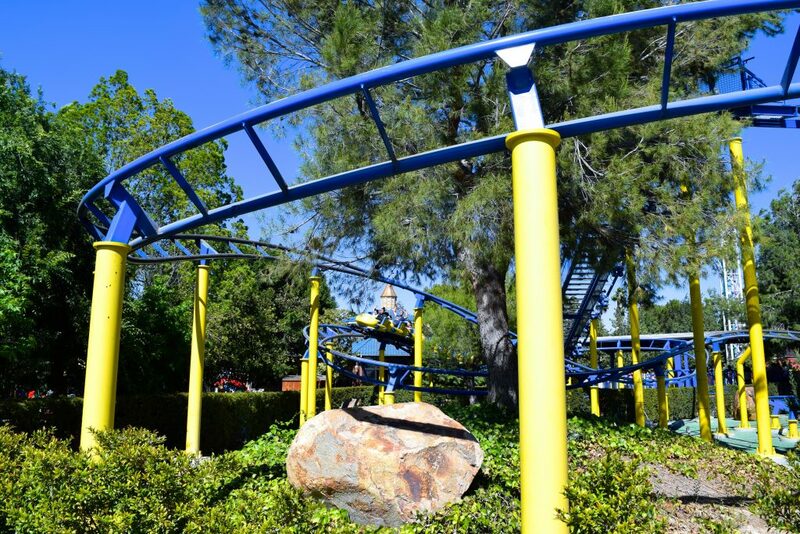 Little Dipper is mysterious little coaster. 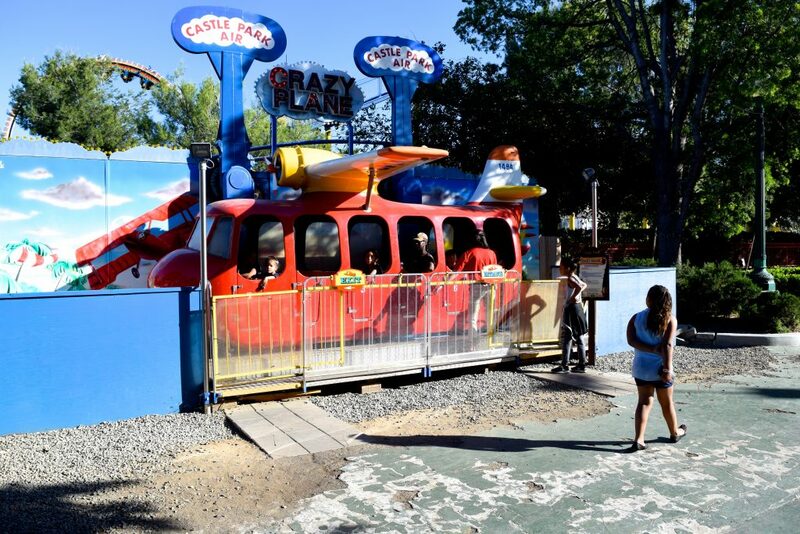 It’s a later Miler design with polyurethane wheels, but it’s not apparent when it was manufactured or when it came to Castle Park. The new ride for 2015 is the bare-bones Larson Sky Dancer in the background. We thought the miniature train was closed based on what we saw here, but we did see it running later. 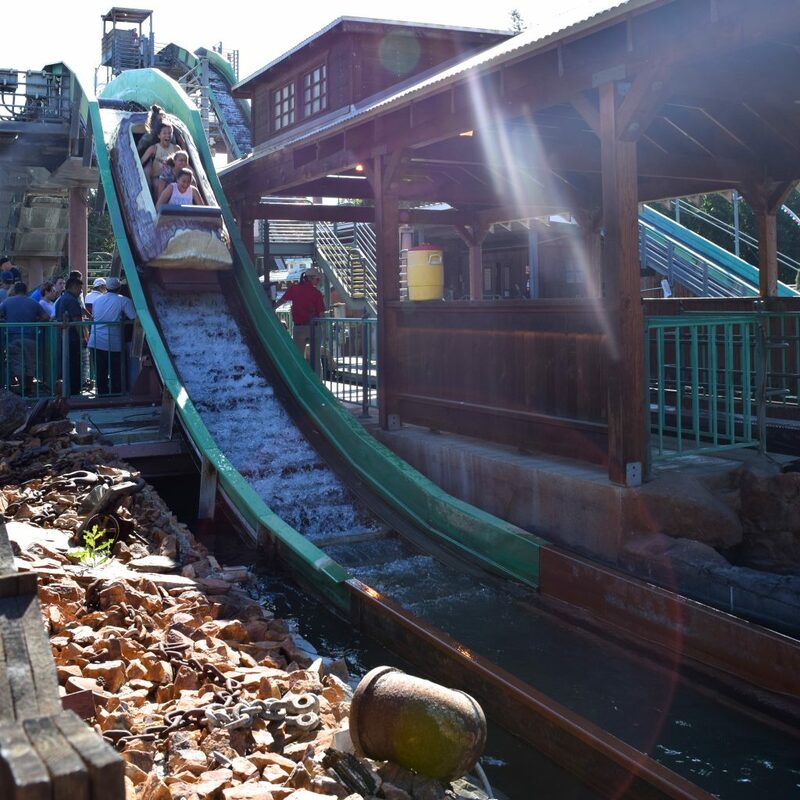 The saving grace of Castle Park is their log flume. It’s a custom build that looks well maintained and offers a great ride with a comfortable amount of wetness. 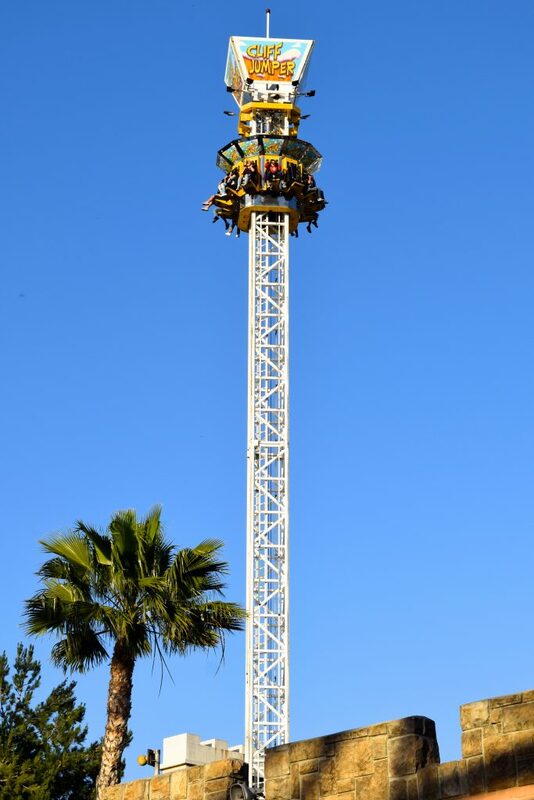 Time for a ride on the Sky Dancer! A little more interesting than a Ferris Wheel, at least. From up here you can see just how nice the scenery is in Castle Park. You can also see what it mess it is down here in the construction area. 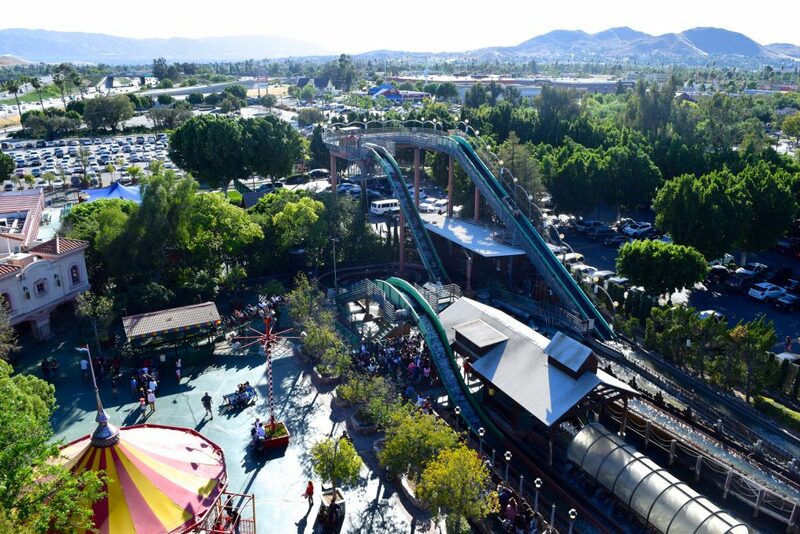 Castle Park is in a unique pedigree of parks where the flume ride is hands-down the best attraction. 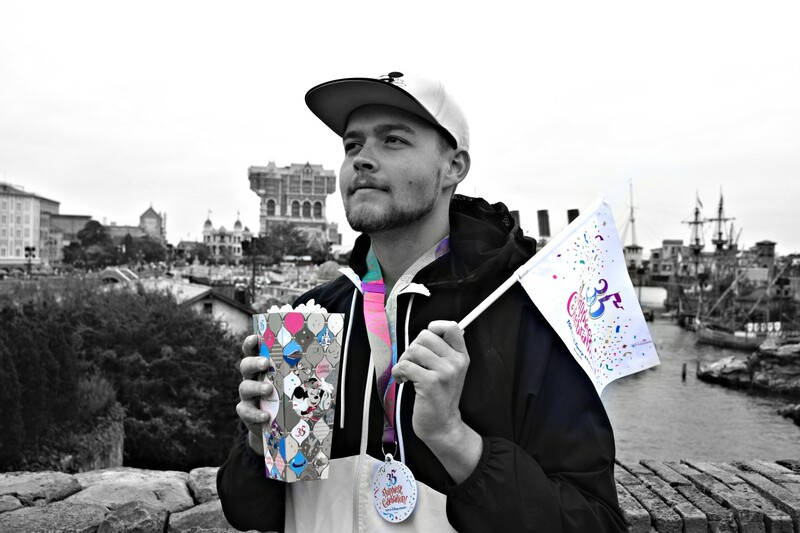 Other parks in this league include Gillian’s Wonderland in Ocean City, NJ and Shanghai Disneyland! 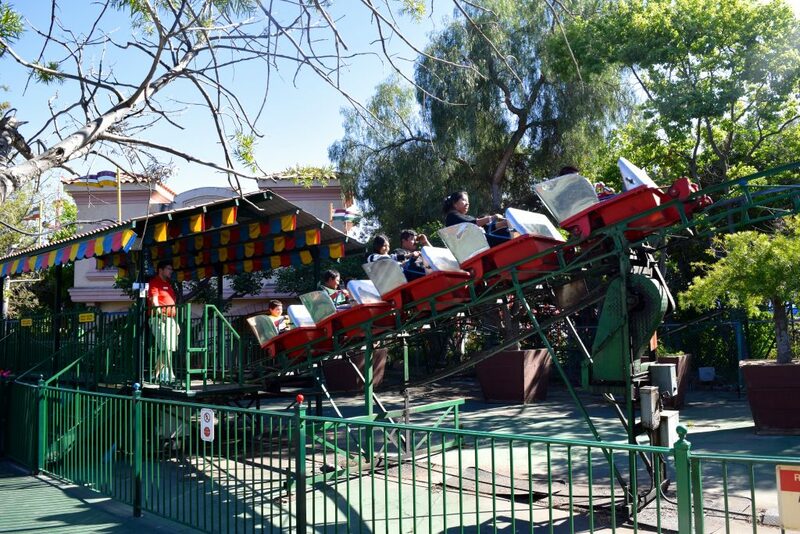 For the areas of the park that maybe aren’t shaded with trees, Castle Park has several rides with canopy fixtures. They only work, however, if you actually fasten a canopy to the fixture. After bearing all we could take, we fled Castle Park for a much nicer park in the area — one that’s not above identifying as a Family Entertainment Center. 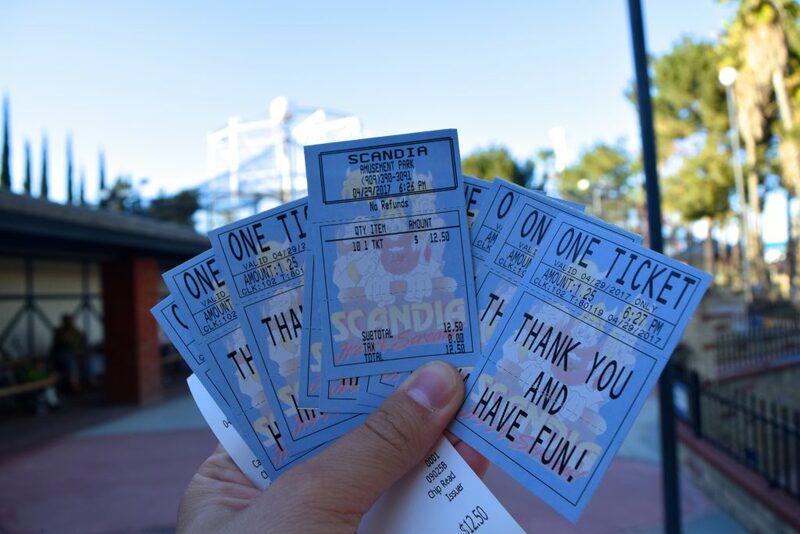 Individual ride tickets still reign supreme at Scandia Ontario. 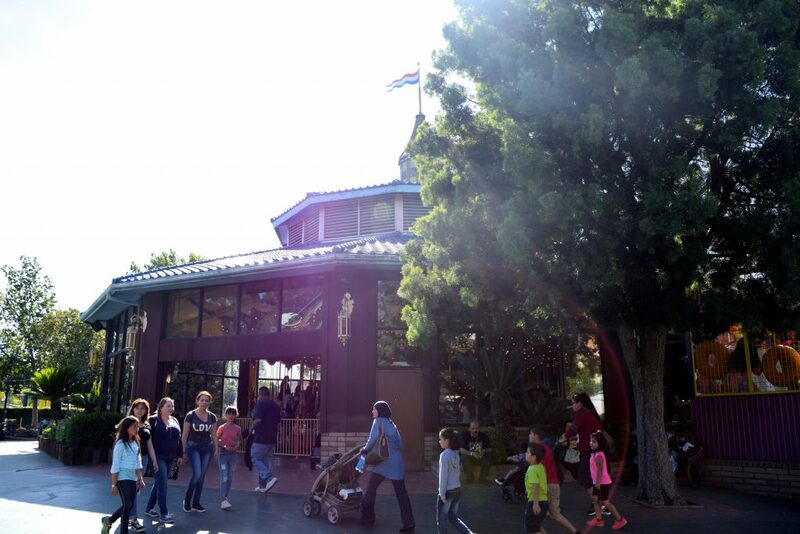 Scandia’s grounds feature giant palm and oak trees. Everything here is beautifully manicured. 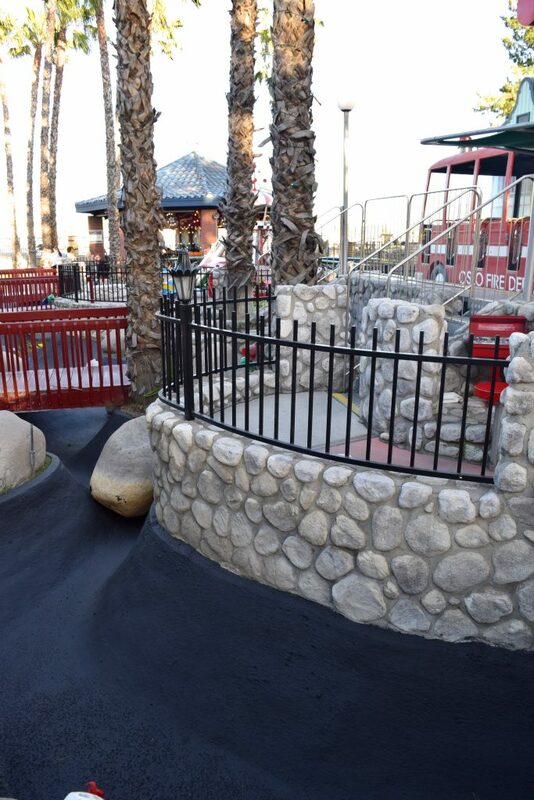 Several of the lagoons have been freshly painted! 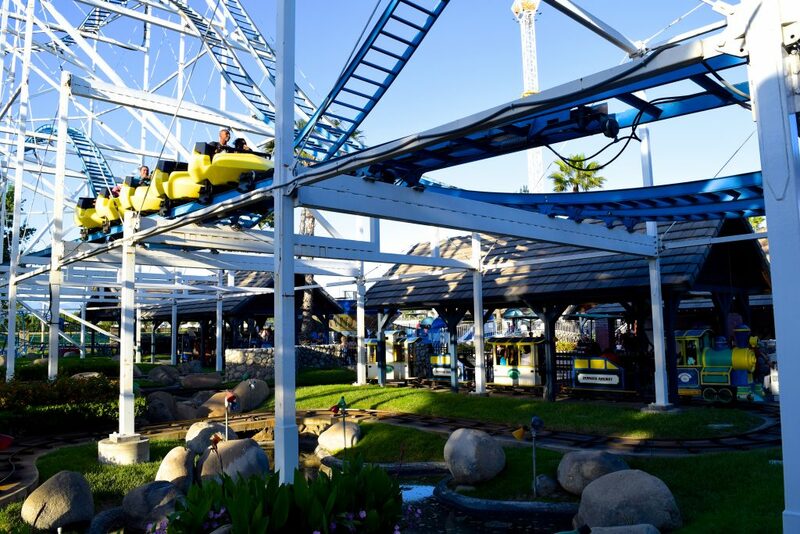 Also looking fresh is Scandia’s one-of-a-kind giant Miler coaster, Screamer. 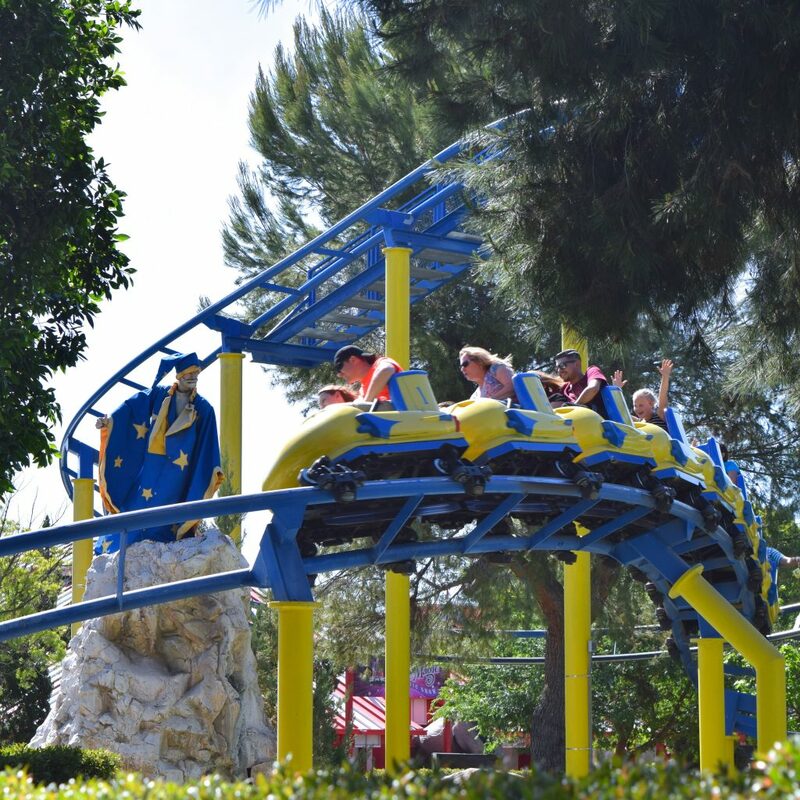 The train on Screamer looks freshly detailed; fresh seat and lapbar padding and a sharp new coat of electric yellow paint. 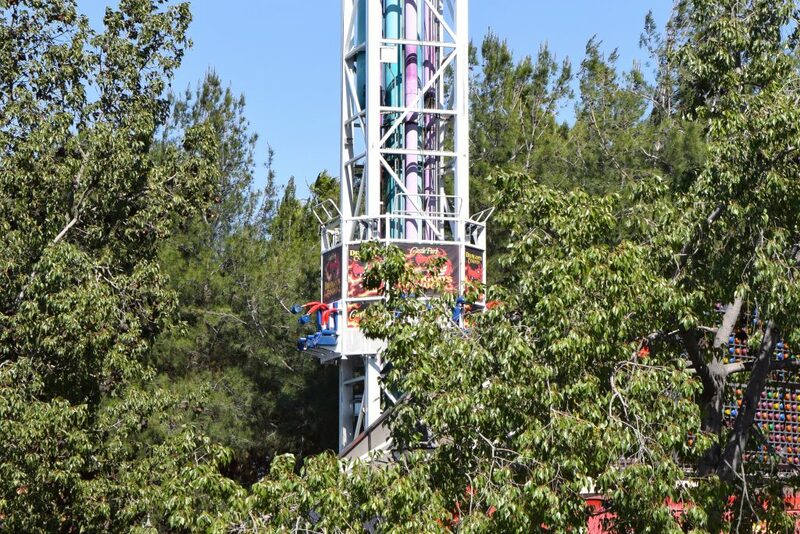 Also looking sharp is Scandia’s ARM drop tower. This is my 3rd visit to Scandia Ontario. I’ve always been so impressed with their economical use of space. Screamer only ever seems to run one train. 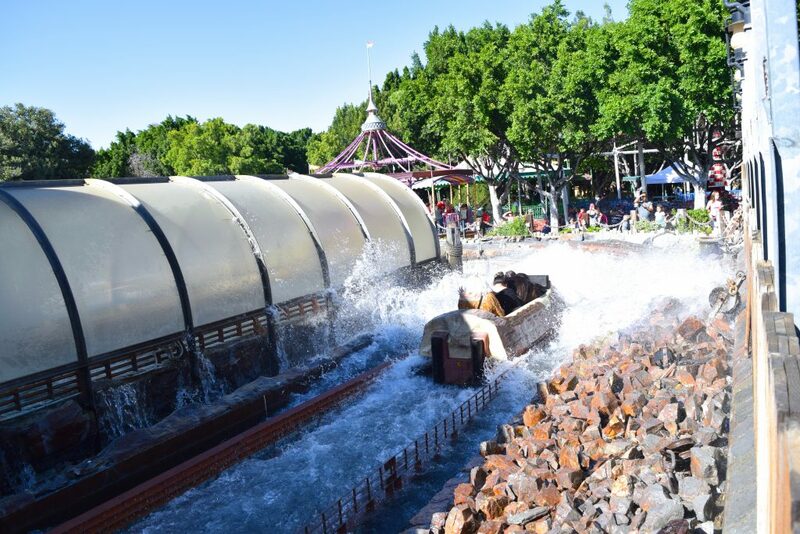 The ride’s probably not often busy enough to need two, so the other train usually stays in pieces until it’s time to swap out the running train. 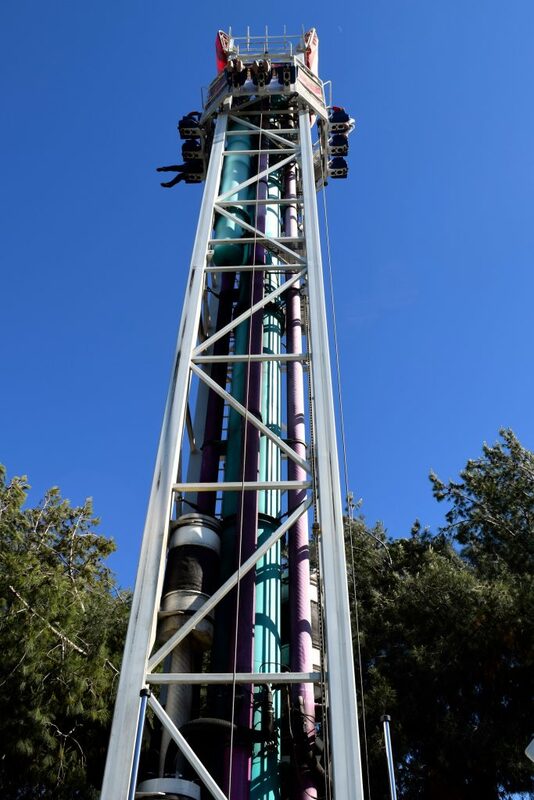 Screamer gives an excellent (if aggressive) ride. Front and back seat rides offer ejector air; the back really flings you into submission. 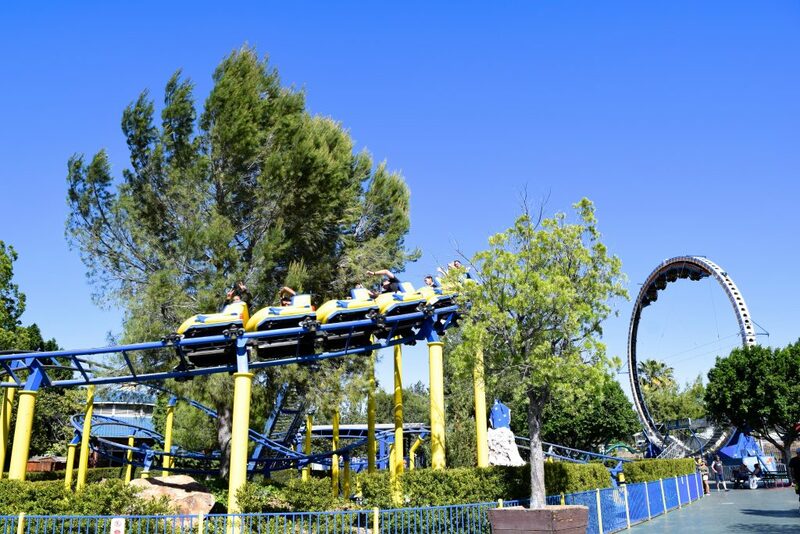 Crazy airtime aside, Screamer offers a smooth and comfortable ride. 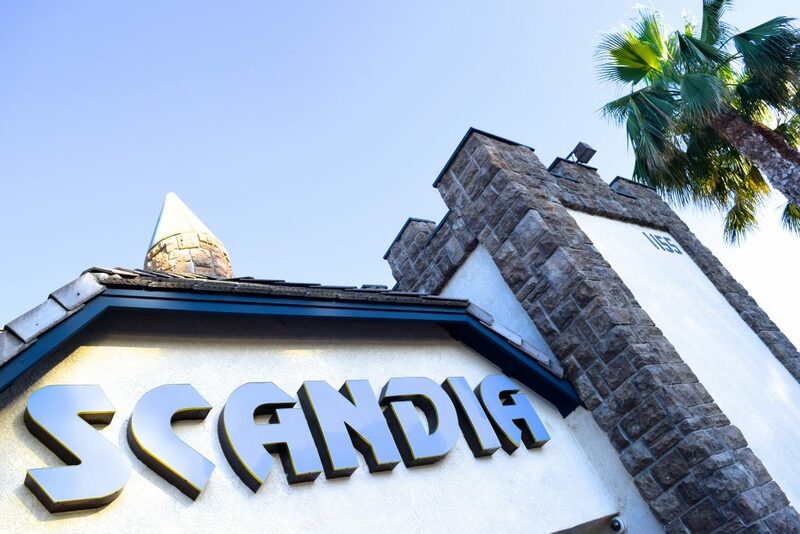 All of Scandia’s flat rides are all in good shape and look like they belong there. 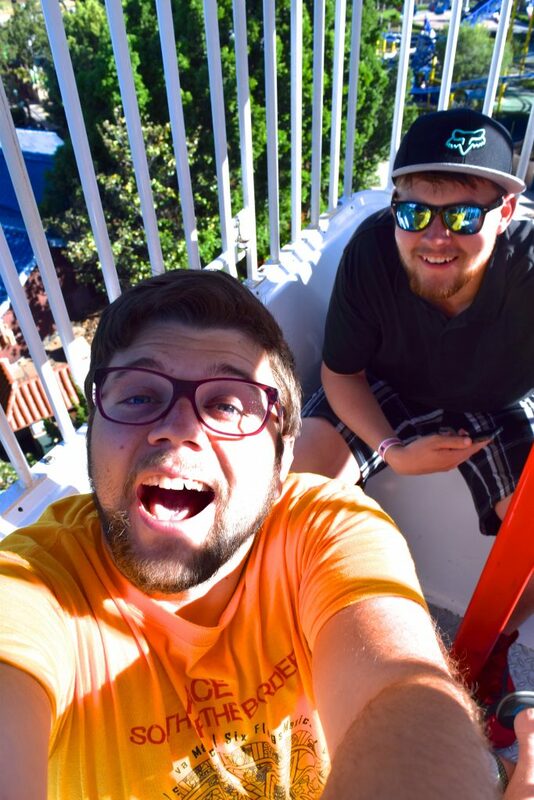 Today was Sean’s first ride on a Tilt-A-Whirl. (Believe it or not). 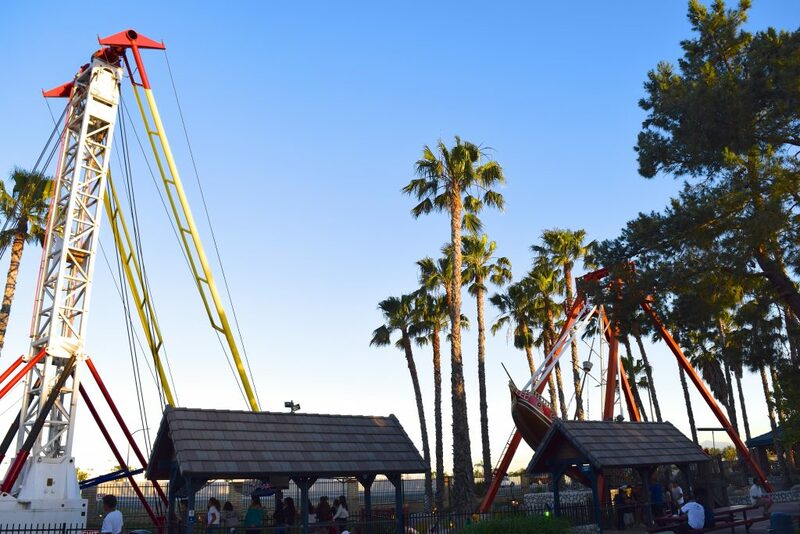 They have an unusual-looking S&S Screamin’ Swing that costs about as much as the other rides here, so it’s a better deal that paying the up-charge for one at other parks. 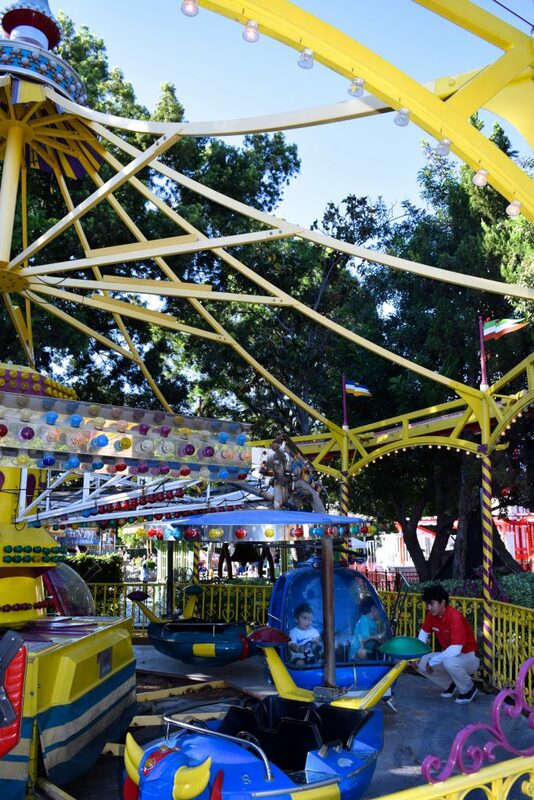 Also their Viking swinging ship ride looks more appropriate in the little Nordic-themed park than most rides of this nature. And that’s a wrap! 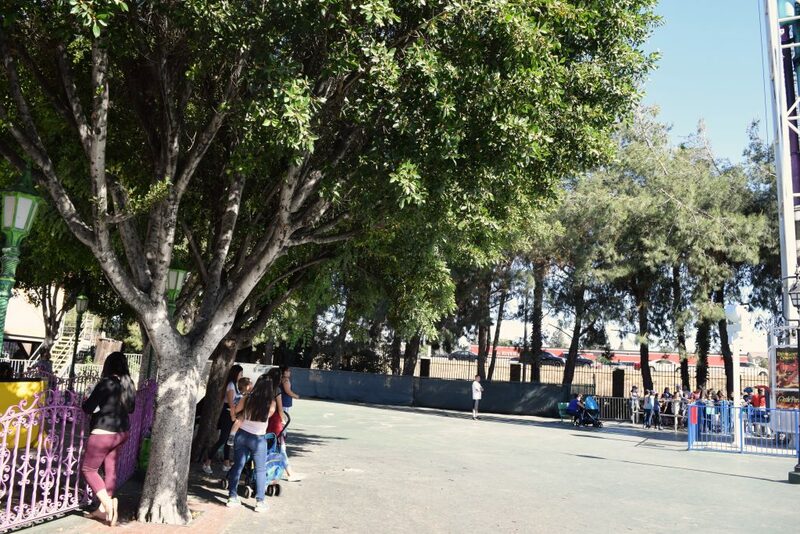 For better or for worse, the small parks of the East LA region provided a full day of entertainment! Any chance you guys got to ride their ghost blasters ride? One of the few better memories I have of the park 4 years ago. 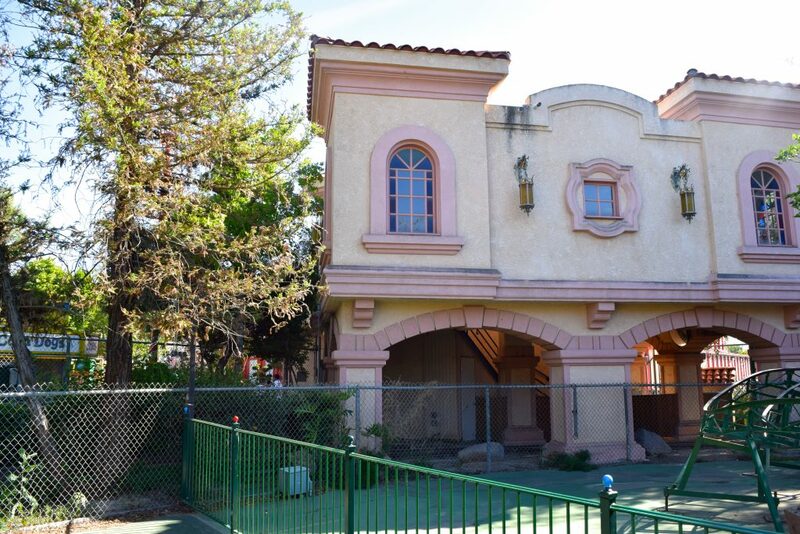 The old parts of Castle Park are so nice and resemble Fiesta Village so much, because this park was built by Bud Hurlbut. 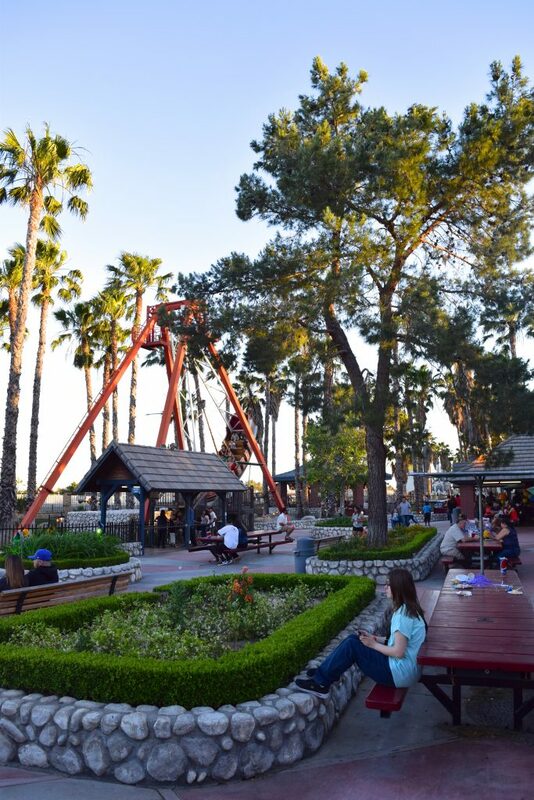 So sad to see his gem of a park, that he built after the Knott’s family bought out his stake in the farm, be in such disrepair. Correct! Our apologies for the mix up! 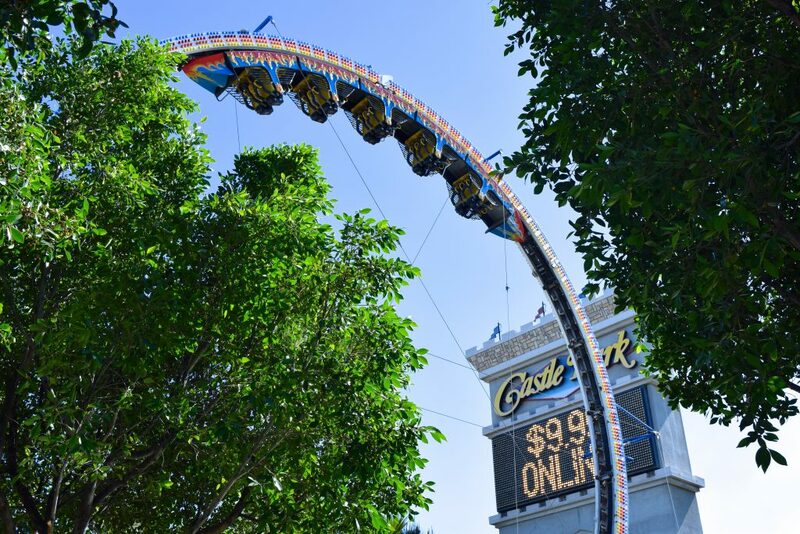 You guys should come back to Castle Park. They’ve done loads of upgrades. 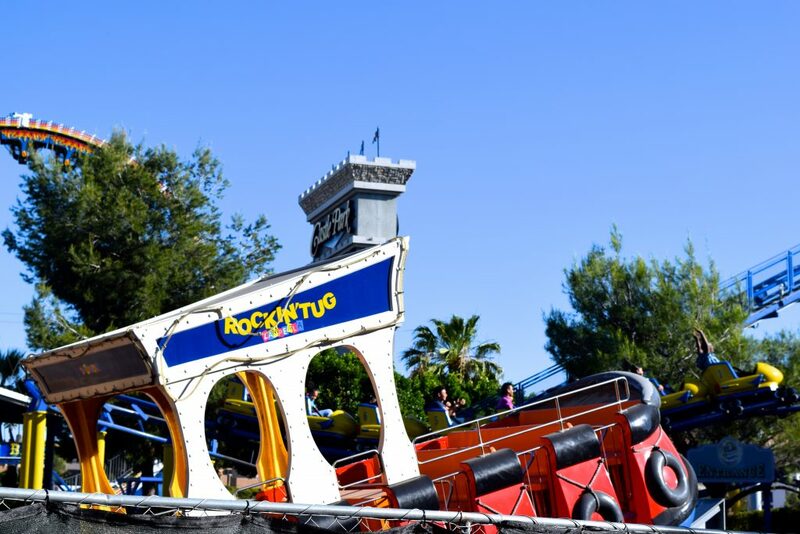 KIngs Crown and Rockin Tug are now open. 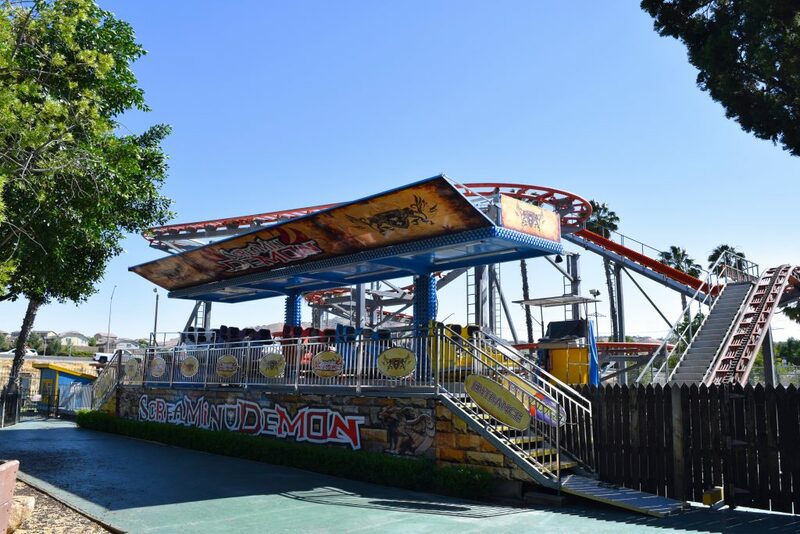 Fireball and Screaming Demon are currently being refurbished, and Spider had reopened back a few months ago, but was suddenly tore down for another large repair.